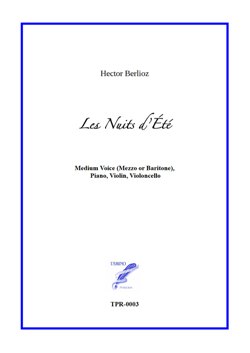 Six songs by Hector Berlioz for Medium Voice, Violin, Cello and Piano. The perfect combination of Lyric and Chamber music, and the very best of romantic songs. Synopsis Hector Berlioz wrote those 6 famous melodies for voice and piano. Later he orchestrated the full cycle. This new arrangement for voice and trio (piano, violin cello) is perfectly suited to the intimate nature of this beautiful music. Formats If you chose the "Digital + Paper score" option, you will receive 2 paper copies of the Full Score, 1 copy of the Violin+Voice Part and 1 copy of the Cello+Voice Part in addition to the digital score.